You’re the type who takes the latest trends and then makes them her own. 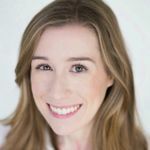 So when it’s time to get engaged, it’s no surprise that a run-of-the-mill engagement ring simply won’t do. 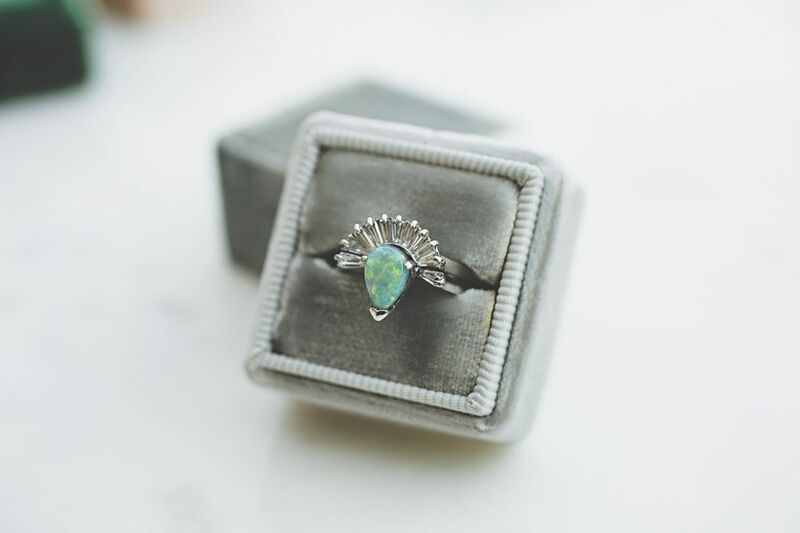 With seemingly endless online inspiration, finding unique engagement rings has never been easier, but you have to start somewhere! 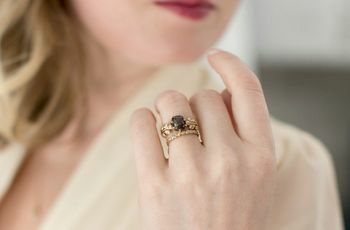 To get you going, we’ve curated some of the best unique engagement ring ideas, from daring black diamonds to trendy hexagonal settings, ring stacks, and more. Ready to make a statement? 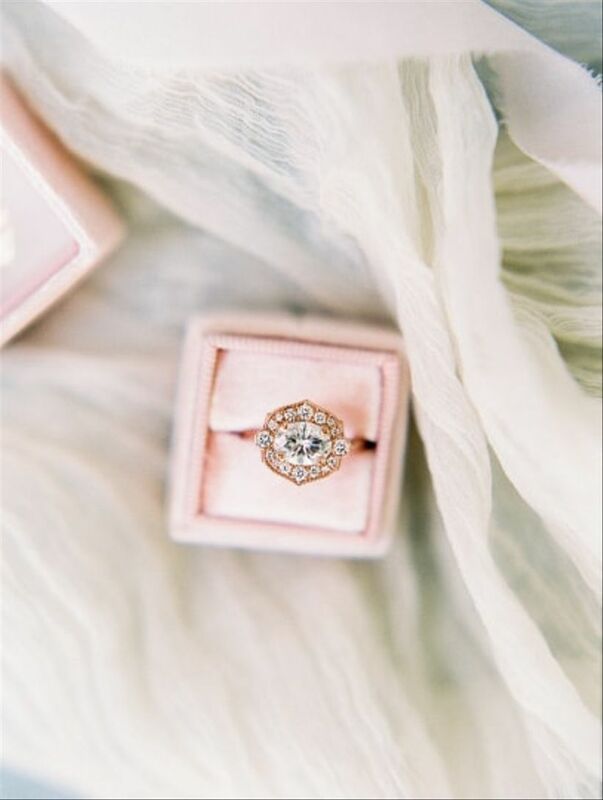 Browse some of our favorite unique engagement rings below. Put a twist on the classic solitaire engagement ring by pairing a round-cut diamond with an unexpected wraparound setting. The twisted pavé band ensures that all eyes are on that center stone! 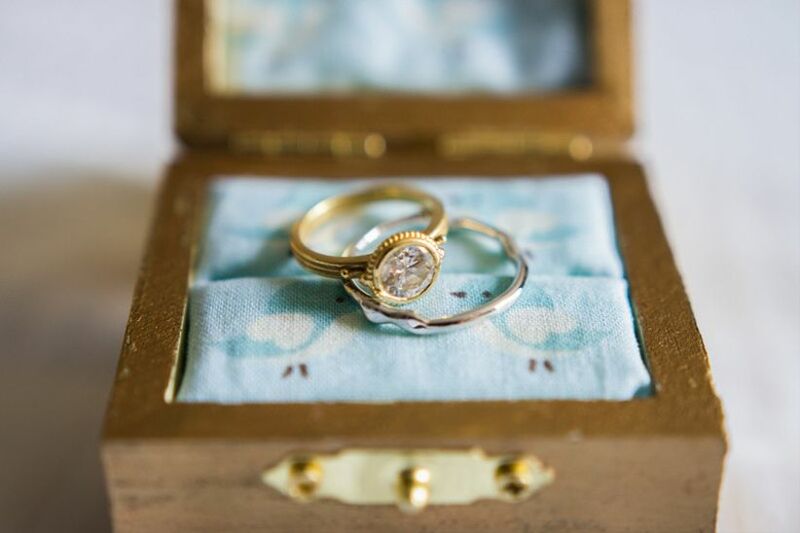 Brides in search of unique engagement rings can always look to the past for a bit of inspiration. 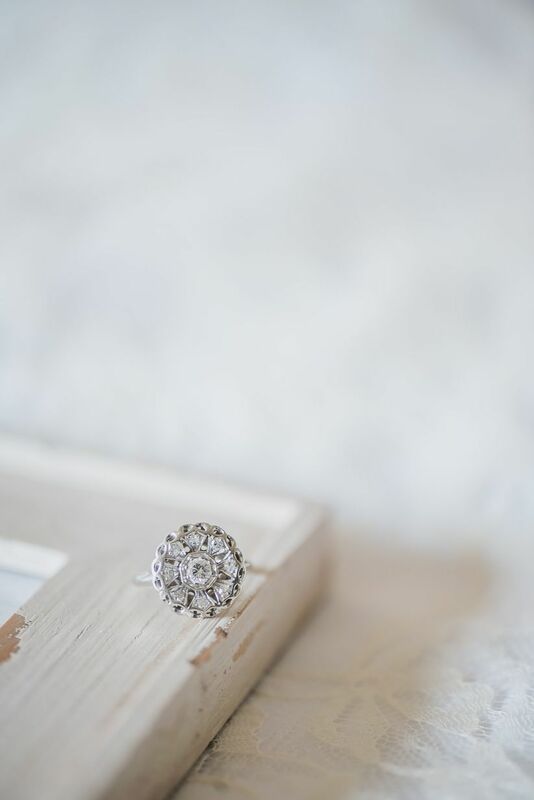 This antique-style ring definitely isn’t short on sparkle — the center diamond is flanked by two smaller stones with an oblong scalloped halo setting. This combination of details isn’t something you see on most modern-day engagement rings, making it a total statement piece. The bezel setting is less common than other engagement ring settings, such as prong, channel, and halo. 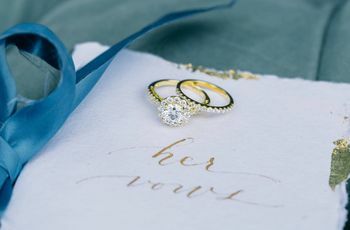 This makes it a go-to option for brides who want an engagement ring that’s unexpected in a subtle way. 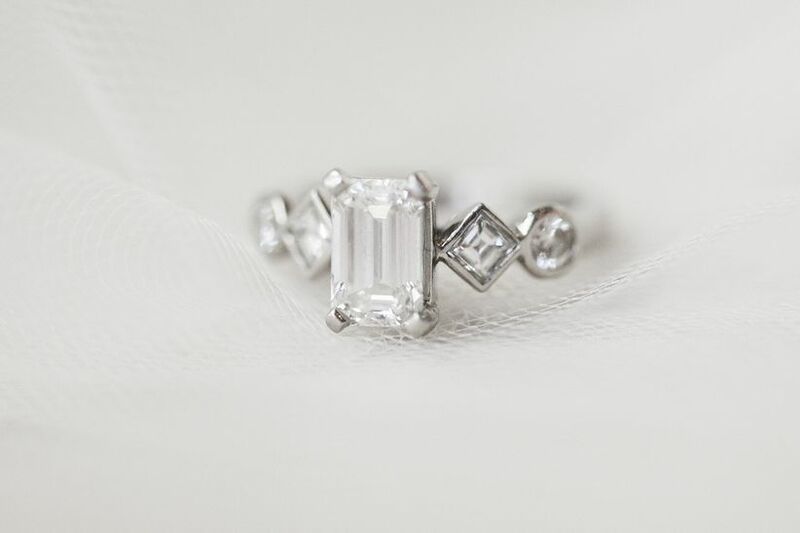 An emerald-cut engagement ring is a beautiful albeit traditional choice. But when you add square accent stones that are set on an angle, the ring instantly gets a dose of unexpected flair. A hexagonal setting is another fabulous option for anyone dreaming of a unique engagement ring. 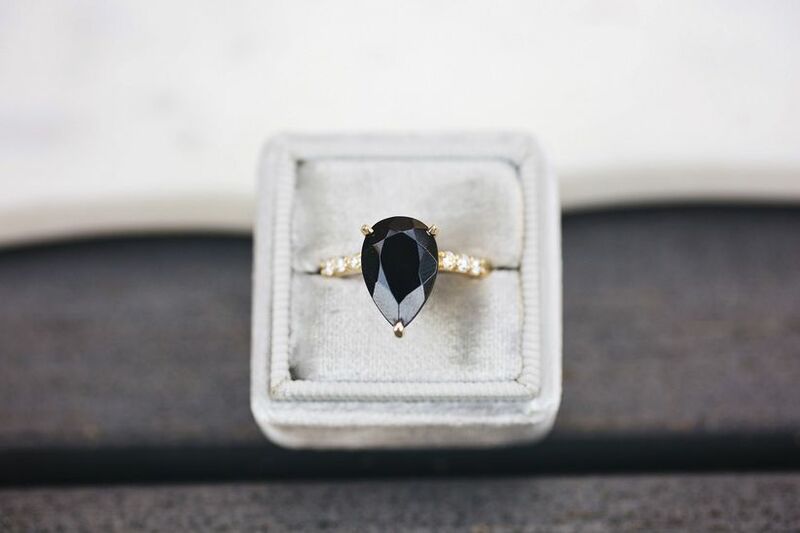 This choice feels trendy yet timeless — you can make the ring look more antique or modern depending on the type of metal you choose and the amount (or lack of) decorative filigrees. 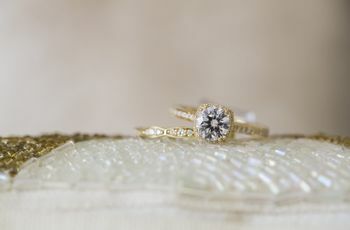 Engagement rings with round halos are something we see every day, but this scalloped option is no doubt a more unusual alternative. 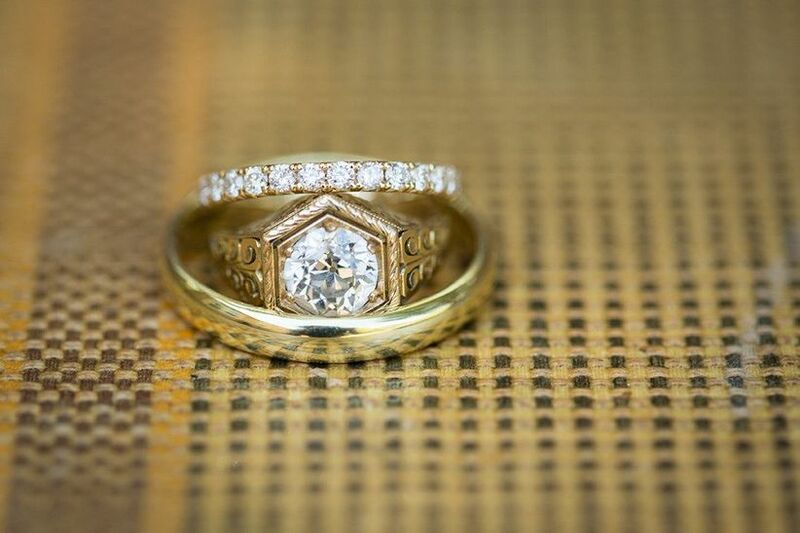 We’re also loving the matching wedding band, which is perfectly shaped to fit with the halo like a puzzle piece. 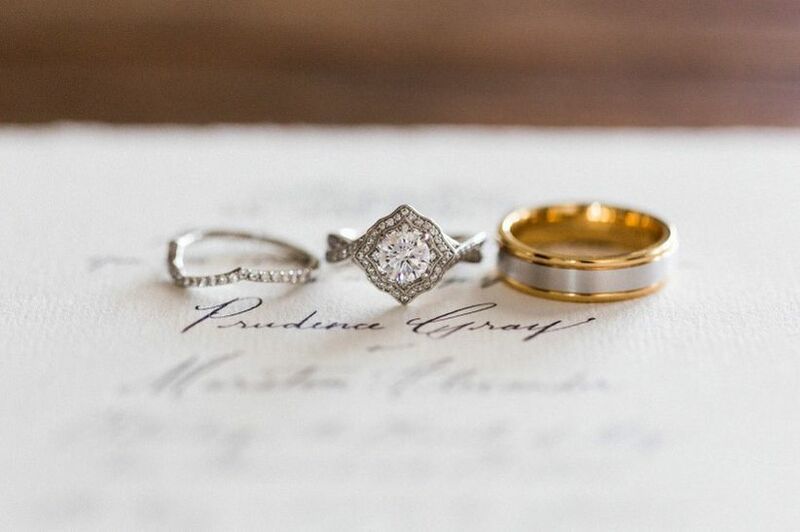 Ring stacks are some of our favorite unique engagement ring ideas for the ultra-trendy bride. 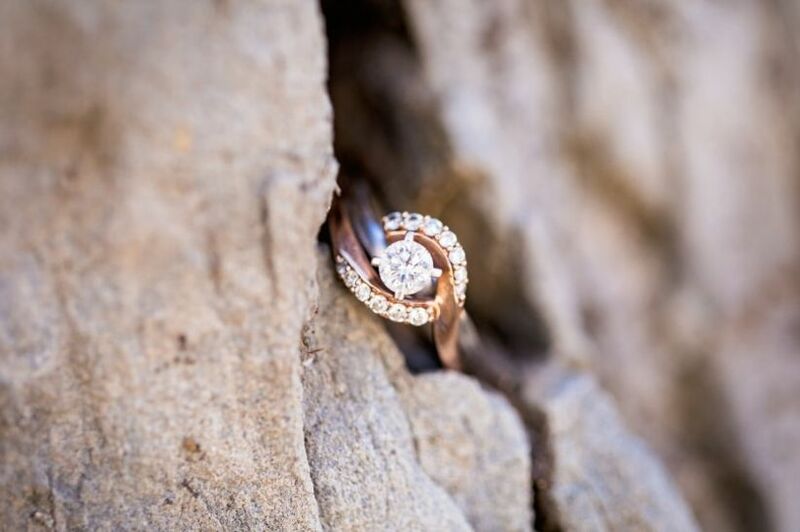 This rose gold engagement ring is a stunner on its own, but the “tiara-style” wedding bands, which go on either side of the ring, will have people stopping in their tracks for a closer look. Choosing an engagement ring with a colored stone instead of a classic white diamond is always an excellent way to achieve a unique look. 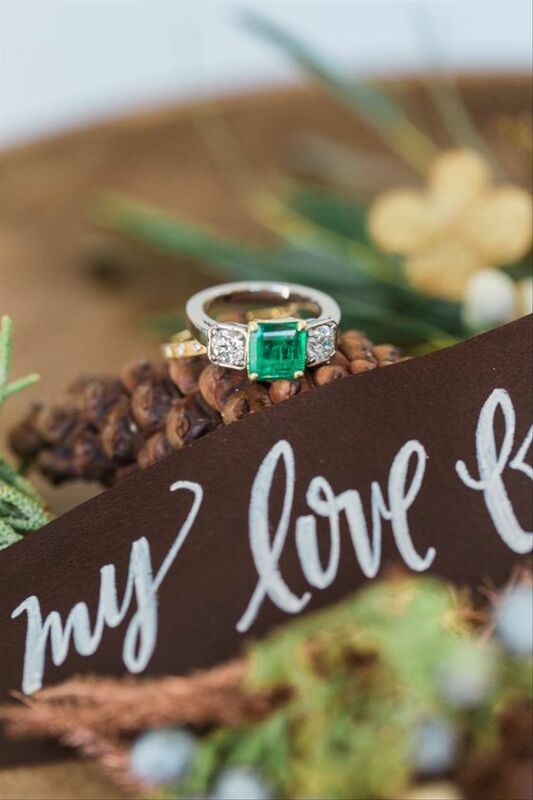 A bright green emerald certainly won’t go unnoticed! Opt for a more traditional setting if you don’t want to be totally outside the box. Green gemstones not quite your style? Try a dramatic black diamond instead. 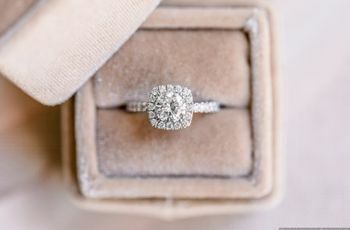 The overall minimalistic vibe of this unique engagement ring ensures that the center stone gets all the attention. Talk about bling! At first glance, this ring looks like one large diamond, but look closely and you’ll notice that it’s actually a cluster of nine different stones. We’re totally in love with the romantic feel of this unique yet elegant piece. 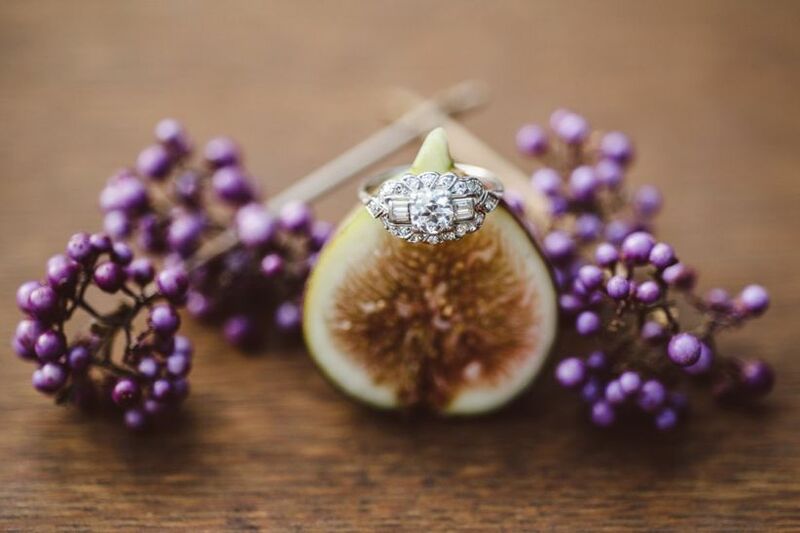 If you love oval-cut engagement rings but aren’t so thrilled that they’re extremely popular these days, consider pairing this cut with a more distinctive setting. 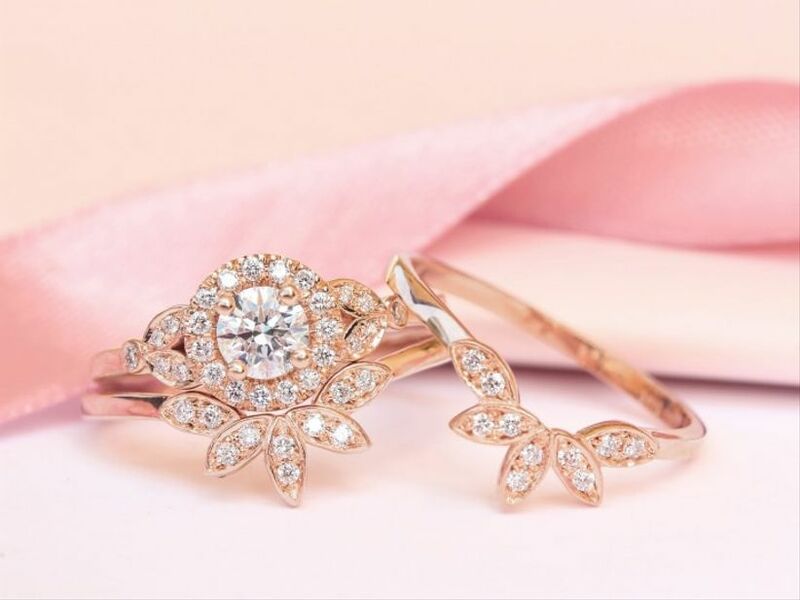 An oval diamond turned on its side is definitely less typical, while a rose gold halo with a slightly angular shape provides additional interest (and sparkle, of course! ).